Santa Barbara hosts a farmers market six days a week. With those and our various fruit stands, there are plenty of ways to seek out fresh produce around town. However, choosing produce isn’t for everyone. Like selecting a “good” wine in Santa Barbara, there is also a lot of pressure to choose proper produce. Really, any foods that you buy at any of our farmers markets and fruit stands are selected locally and delicious. It is hard to go wrong, but self-selecting has drawbacks. The solution to this problem is the CSA box. Most of the local farms in town offer some form of CSA box. These are the same farmers at the farmers markets and several of the boxes are shared between multiple farms. 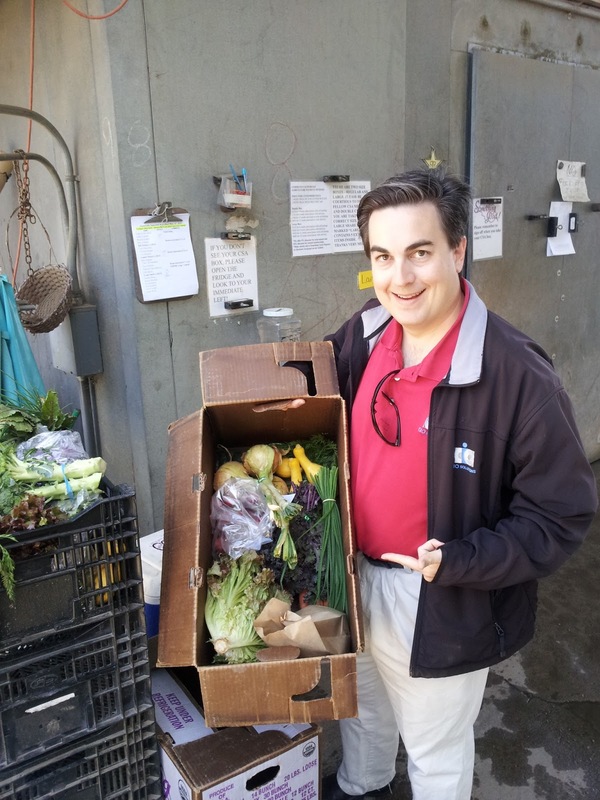 For $20-30 per week, a giant box of fresh fruits and vegetables are selected for you by the local farm. These are then delivered to your door or available to be picked up on site. CSA stands for “community supported agriculture” because you are buying into a temporary share of the land that is being harvested. Typically you pay in advance several weeks and collect the literal fruits of labor. For a complete listing of CSA boxes in town, see the CSA box price guide. A typical box contains an assortment of about 10-12 types of freshly picked fruits and vegetables. The larger box you buy, the more (and more variety) you receive. The last box that I received was from Givens Farms and had snap peas, carrots, lettuce, leeks, chard, strawberries, avocados, spinach, cabbage and cilantro. In my experience, a whole box is a tad overwhelming to my family of four. I have historically had to share a box with a friend or coworker (and share the cost). Doing so has made the quantity of the produce less overwhelming and made for less waste. The food in the box is delicious every time. Opening the box is like an adventure in food. Reading over the list, you may already buy some of the items on a regular basis (and sometimes even when they are not in season). When you see something like chard, however, you may be a little hesitant. Before the CSA box, I had never tasted or cooked chard. Part of the charm of the box is that it introduces you to new foods and flavors. You are also being introduced right at the peak of the food’s freshness (second only to grazing). This can be a turn-off for non-adventurous and uninventive home cooks. The rest of us can make use of an internet search and quickly become an expert in a vegetable that they had only previously heard of. Just because it’s a new vegetable doesn’t mean that you will like it. Fennel seems to make it into my CSA box when I least expect it. No matter what I’ve tried with fennel, it always ends up making me think that I’m cooking with black licorice. The look of the herb is so inviting like dill, but the taste is terrible to me. Many CSAs have prepared for these types of dislikes with a trade box. If you pick up your box from the farm, you can trade out an item or two that you don’t like for an item that’s in the box. Some CSAs will start the trade box with extra vegetables that they have on hand. Others will rely on early people leaving the items that they just don’t want that week. Those who get their CSA delivered do so at a price (usually $5) but also at the cost of being without a trade box. Another benefit to visiting the farm, however, is getting to know the farm itself. Doing so helps the farmers know what you (the community in CSA) like or don’t like. While you’re there, they might even hook you up with an extra item of produce. I like the idea of the CSA box because I like to get creative and work vegetables into my meals. I like that my daughter learned what kale is before going to kindergarten (and not until after college like her father). Still, not everything in the box is easily made into dinner. Neither my wife nor I grew up eating beets and have a hard time with them as adults. This makes it even more difficult to convince the kids that they’re wonderful. Instead we have found the trick to hiding our vegetables. The key to this was getting a good blender. Whenever I get a couple of beets, I clean them and then chop them up (greens and all) and leave them in a bag in the freezer. A handful goes into a smoothie along with strawberries, pineapple and whatever other fruit or juice I have on hand. Beets make a beautiful red color and tone down the sweetness of a smoothie. Doing this, I am able to hide the nutrients locked away in the vegetables that I am not fond of. If your kids are not a fan of smoothies, consider making popsicles from your leftover smoothies. Even with beets and spinach, kids love them. Another criticism of CSA box owners is that too much waste is created. Even if you are splitting the box with a friend, there are some other tricks. Chopping and freezing as I did for the beets works well. Still, sometimes enough is enough. When this happens, I recommend putting your box on hold until you’re ready to receive again. Your CSA will be happy to do so for any length of time. If it’s the large amount of food scraps that you’re concerned with, see my worm article to get ideas on how to constructively deal with your food waste. To best preserve the vegetables as soon as you get them, I recommend giving them a nice cold water bath. This keeps them fresh longer. There is no better time to join a CSA than now. Santa Barbara’s Spring and Summer seasons bring about delicious produce. If fruits and vegetables aren’t your thing, take a look at the meat and seafood boxes sold by other farmer’s market vendors. In Santa Barbara, when it comes to fresh food, you really can’t go wrong. I have been a member of Plow to Porch for about 2 years and love it! They deliver an equal variety of fruits and veggies each week. We get the smallest box (bambino) since there are only 2 of us, and rarely does anything go to waste. It is fun getting things I normally wouldn't get at the farmers market - fava greens, radicchio, kiwi, and star fruit, although it can get tiresome getting kale on a too regular basis. CSAs are terrific. If you try one and don't like the variety you can always quit or change farms!